Apple has been hit with a new lawsuit that accuses the Mac maker of violating a patent related to quickly booting a computer operating system, an invention that was initially granted to LG electronics. The patent in question, RE840,092, is entitled "Method for Quickly Booting a Computer System." 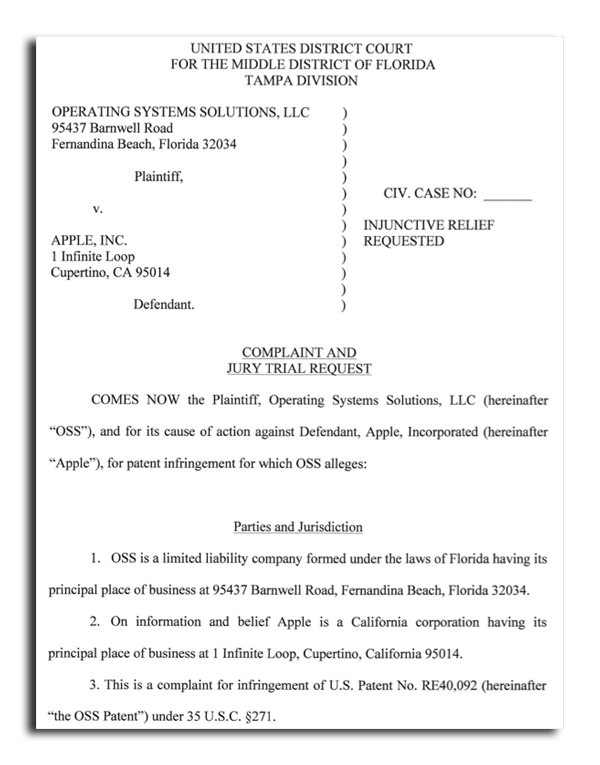 The owner of the patent is the company Operating Systems Solutions LLC, based out of Fernandina Beach, Fla.
OSS has accused Apple of violating the patent with its Mac products running the Mac OS X operating system. Specifically, the lawsuit cites the MacBook Pro as an infringing piece of hardware, but argues that any systems running Mac OS X are in violation of the patent. In the lawsuit, OSS acknowledges that the patent-in-question is actually a continuation of an earlier invention, U.S. Patent No. 6,434,696, first filed in 1999 and granted in 2002. The original owner of that patent was LG Electronics, of Seoul, South Korea. The lawsuit does not indicate what involvement, if any, LG has in the complaint, or any ties it might have to the current patent. OSS revealed that the original LG patent was reissued in 2004, and issued again in February of 2008 as the OSS patent. The patent cited in the suit describes a "quick boot process" that includes performing a power-on self test POST and saving the contents of memory and the status of devices that may be attached to a machine. It includes references to "config.sys" and "autoexec.bat" boot files. "The personal computer system may reboot quickly because of omission of execution of the initial device configuration filed and the automatic batch file," the filing reads. The original invention is credited to Seong-cheol Kang of Korea. OSS has asked that the court find that Apple has infringed on the patent, and the Cupertino, Calif., company be required to provide lost profits and damages to the plaintiff. The complaint was filed last week in U.S. District Court in the Middle District of Florida, Tampa division.